If you’re renovating your kitchen, one of the biggest things you’ll be choosing is cabinets. Cabinets are the main focus of any kitchen, and as such, you want it to be a pleasing environment to spend time in, for you, your family and friends. And your choice in cabinetry reflects your own personal tastes and style. Custom Kitchens, the owners of Outer Banks Custom Renovations, carries a large variety of cabinet options and manufacturers, such as Medallion, Timberlake, and Shiloh, for you to choose from to create that perfect ambiance for your kitchen. Whether in dark oak, light maple, or any other variation of woods and stains, what will your kitchen say about you? With the professional design team at Custom Kitchens, your cabinets can speak volumes about your desire for quality and beauty. With dozens of options to choose from, and a variety of installation configurations, your kitchen will be the way you always dreamed it would. Every kitchen is different and every layout is custom fit to your individual needs. 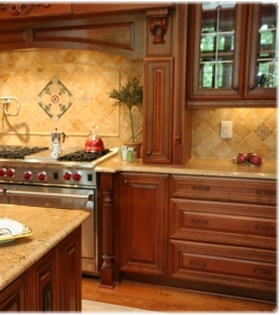 Our goal is to provide you with the cabinets that best fit your preferences and lifestyle. If you are thinking of remodeling your kitchen and installing new cabinets, fill out the contact form and let one of our professional sales staff make an appointment to talk with you. And as a bonus for filling the form out, we’ll waive the design fee, a $200 savings! With our 3D modeling design software, we can show you what your kitchen will look like with your new cabinets. Now you’ll know what it looks like before you even buy it!